Few days ago a very strange coincidence happened in our humble little home. I had a crazy craving for pancakes and Mark was wondering around the kitchen with a pack of blueberries that where close to their use by date. Then my cravings latched onto this and developed into not just wanting pancakes, oh no, now it was not just any pancakes… now I really wanted American-style blueberry pancakes. Mark checked the content of the fridge and pantry and decided that we are good to go… Happy times! Sieve the flour, salt and baking powder into a bowl and add the sugar, make a well in the middle. Separate your two eggs and place the yolks with the milk and melted butter into a bowl and whisk. It will be helpful not to have ice cold milk as this will cause the butter to set again, not that it matters to the cooking process, it just doesn’t look so good when making. Whisk the egg whites in a clean bowl with a pinch of arrowroot, until stiff peaks form when the whisk is removed. Add the wet ingredients into the well in the flour mixture, and gently whisk to create a batter, don’t worry about any lumps, it proves they are home made. 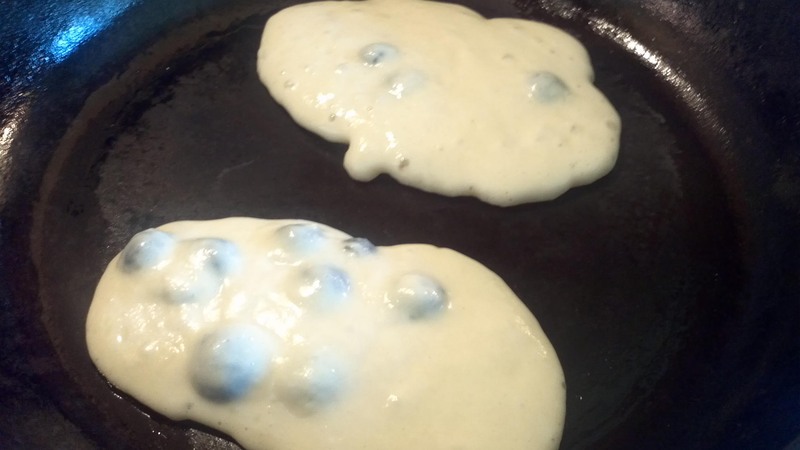 Now add your blueberries into the batter and stir. 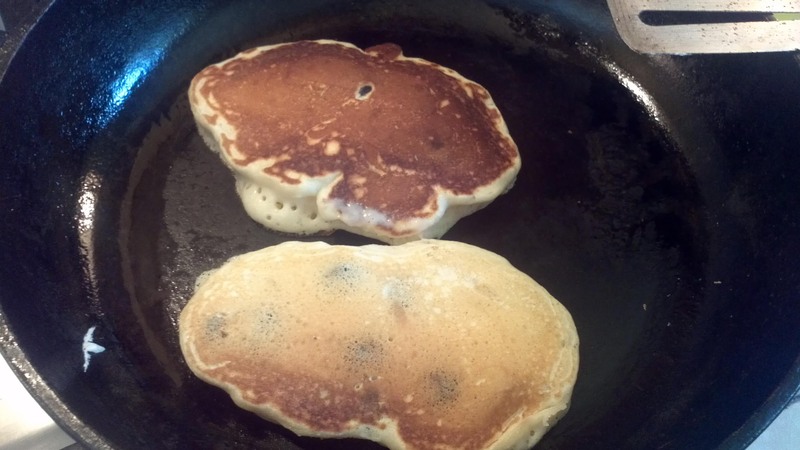 The batter should be the consistency of cake batter, it will not be runny like a traditional pancake batter, this is not a batter you will be running around the pan to create a flat object. Heat a heavy non-stick pan over a medium heat and brush it with some vegetable oil. Use a large spoon and scoop up some batter and gentle tip the contents into your pan. Don’t be tempted to touch it just leave the mound of batter to settle as it wants, remember every time you touch it somewhere a little bubble pops and your pancake becomes less fluffy. Cook the pancake for a couple of minutes, or until bubbles start to form on the surface. When you lift up the edge of your pancake the underneath should be a nice golden brown. Turn the pancake and cook the other side for additional minute until golden-brown also. Remove from the pan and reserve in a warm place. Serve with maple syrup or with icing sugar. Great pancakes! 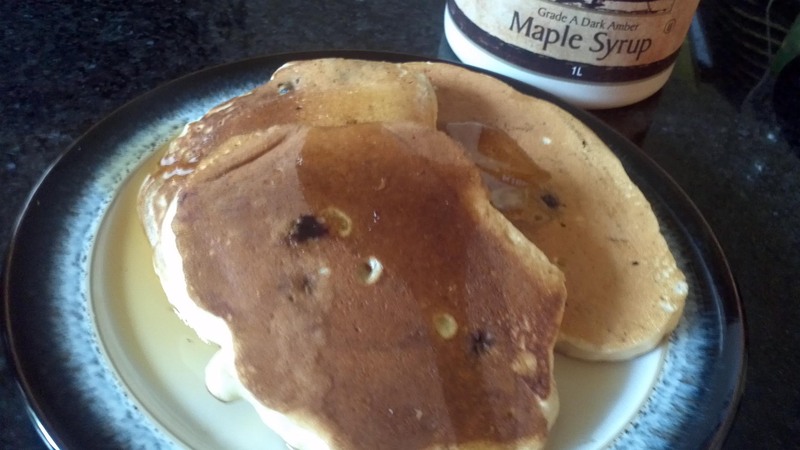 We love adding blueberries to our pancakes as well! I can’t get blueberries easily here, but I am going to try this with the local variety of blackberry – it looks yummy! 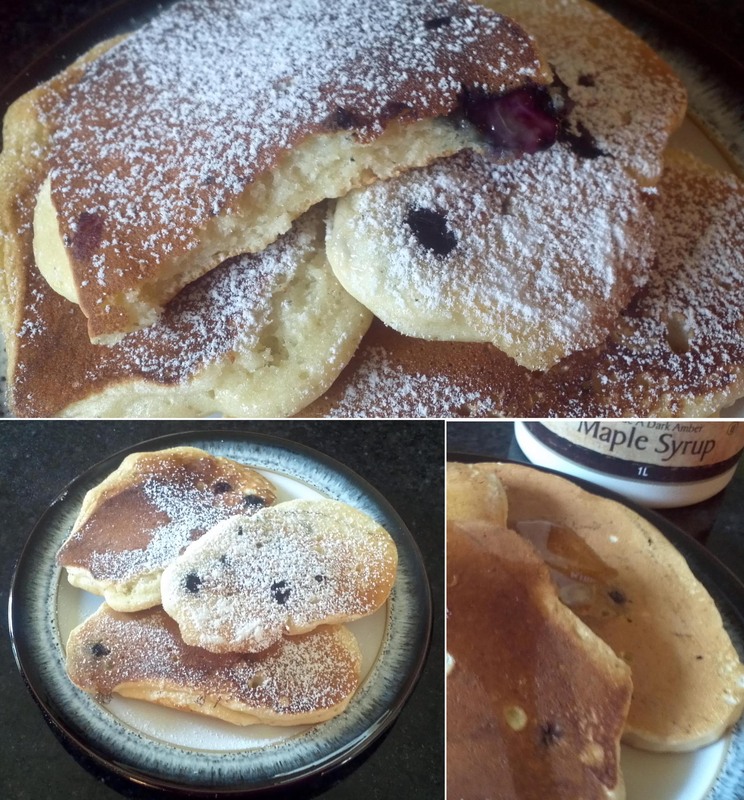 I love blueberry pancakes and these look delicious!!! I definitely am going to make these. Yummy! 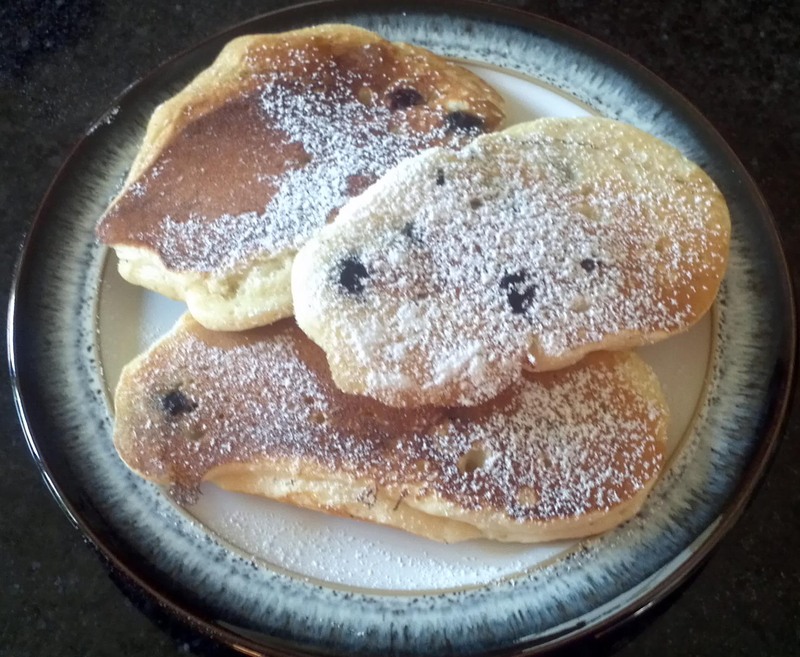 We love blueberry pancakes here! We normally don’t put powdered sugar on it, but that is a real treat! They look delicious! I feel hungry now! Blueberry is my favourite pancake! These look very tasty! thanks for sharing! Great recipe. I ate Amercian=style blueberry pancakes once at a restaurant and loved them. Do you have leftover? 🙂 That sounds good too. the blueberry pancake looks really appetizing!